Clay Jenson comes home from school and finds a package from an anonymous sender on his doorstep. When he opens the package, he discovers seven cassette tapes recorded by Hannah Baker–a deceased classmate who committed suicide by swallowing a handful of pills. 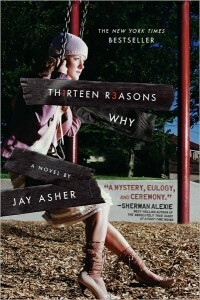 On the tapes, Hannah explains the thirteen reasons why she committed suicide, and Clay is one of those reasons. While the Thirteen Reasons Why was compelling, moving and eye-opening, the book is hard to recommend. The book is not an “easy read.” Let me clarify. Yes, I could not put this book down. Yes, I tore through the pages. The book is easy to read but hard to absorb. The book absolutely wrecked me. When I hit Clay’s chapter, I completely lost it and not only cried but wept. An important note. Many adolescents struggle with suicide for many different reasons. Hannah’s struggle is only one of countless struggles. She didn’t fit the stereotype of suicidal teen which I appreciated. A person’s reasons for suicide do not have to be monumental to the outside world; they only have to be monumental to the person. Hannah’s reasons may not match up to someone else’s reasons, but they are valid, nonetheless, and true to life. Overall, I give it 5/5 stars. True to life and truly impactful.